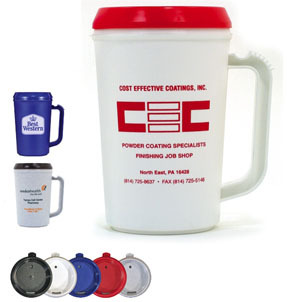 Custom Imprinted Insulated Thermo Mugs, Customized, printed. Custom Imprinted Insulated Thermo Mugs. For insulated travel mugs, click here. Thermo Mug Colors: White, Blue, Granite Gray. Imprint Colors: Standard ink colors. Multi-Color Imprint: Add 45.00 set-up per color, plus $0.40 per running stein. Registration will vary 1/8" in any direction making close registration impossible. Minimum order 250 pieces for multiple color imprint. Imprint Area Approximate: For 75022: 3-1/4"W x 4"H per side. Overruns/ Under runs: We reserve the right to ship and bill 5% over or under the ordered amount on custom imprinted merchandise. Order NOW and save time and money! To place your order, click here. Then follow the instructions in the ordering form, or call us at the telephone number shown at the end of each page to place your order.